Philadelphia, PA – Adding further credence to Chip Kelly’s claims that he and Howie Roseman did not directly speak at all last season, a leaked report has shown the NFL front office originally denied an approved contract between the Eagles and recently released running back DeMarco Murray. Kelly made claims today that he told a middle man about potential targets he hoped the Eagles would acquire before the 2015 season. Roseman, he said, did all of the contract negotiations. Philadelphia, PA – Howie Roseman is at it again, as the man apparently in charge of making personnel moves for the Philadelphia Eagles has announced that running back DeMarco Murray will be traded to the Miami Dolphins, not the Tennessee Titans as was once reported, in a move that will net the Eagles two top-tier defensive players. When the trade is finalized by the league on Wednesday, the Eagles will officially acquire shut down cornerback Byron Maxwell and stud linebacker Kiko Alonso in the blockbuster deal. I would say we are, yes. 2015 is the worst year I can remember experiencing in this city. The Phillies lose close to 100 games, the Eagles miss out on the playoffs with one of the most HATEABLE rosters in franchise history, the 76ers are historically terrible, and the Flyers are far and away the only bright spot in the city and they’re three games over .500. It has not been a great year for sports in this city. Philadelphia, PA – As a result of several Carolina Panthers menacingly wielding a bat toward New York Giants wide receiver Odell Beckham Jr. this past weekend, the NFL has banned all accessories and non-essential items during pre-game warmups. The ban has negatively affected several member of the Eagles. Sam Bradford, for one, typically walked out onto the field during warmups using a pair of crutches. A rare sight, DeMarco Murray with his helmet on and holding a football. Philadelphia, PA – DeMarco Murray heard from the NFL front office Tuesday morning and learned he will receive a one game suspension for his horrendous inactions during Sunday night’s blowout loss against the Cardinals. The league suspended Murray for his “egregious disregard to playing the game of football” and for multiple “deep shoulder shrugs” and “eye rolls” directed towards the heavens. Foxborough, Mass – Following the improbable 35-28 victory over the mighty New England Patriots, Chip Kelly had to answer questions following the win on why he decided to limit or even outright bench running back DeMarco Murray for nearly the entire second half. When asked head on why Murray sat in favor of veteran Darren Sproles and relative unknown Kenjon Barner in the biggest game of the year, keen observers noticed a faint smile creep up on the corners of Kelly’s mouth. “We’re…umm….saving him for the playoffs. Yeah, that’s the ticket!” Kelly said. 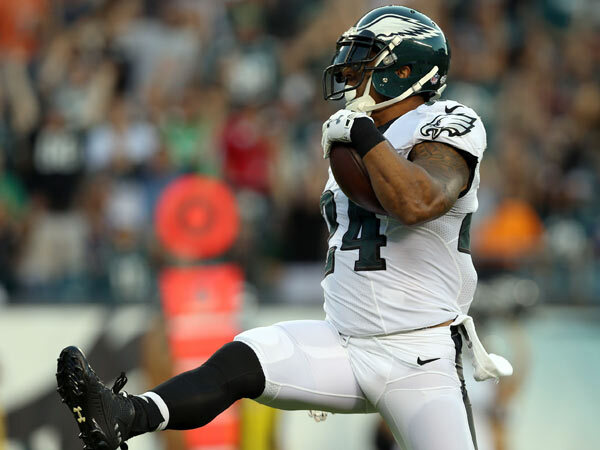 Philadelphia, PA – Chip Kelly benched Ryan Mathews last night during the Eagles 16-27 loss against the Carolina Panthers in favor of DeMarco Murray, who seemed a step slow all night and hesitant to hit holes opened by the Eagles meager offensive line. The normally reserved Kelly did not shy away from media questions during his post-game press conference last night in Carolina. “It was unacceptable. He blatantly defied orders to look confused and hesitant when he received a handoff, he didn’t fall down at the slightest bit of contact, and he didn’t meekly tip toe out of bounds five yards behind the line of scrimmage when faced with a linebacker,” Kelly said. “It’s why he didn’t see the field for more than a few plays after that. It’s all about the system we run in Philadelphia, and he didn’t fit that tonight,” Kelly said.